Happy St. Patrick’s Day, friends! Are you celebrating? Are you wearing green? Drinking green beer later? While I have never been a fan of green beer on St. Patrick’s day, I am 100% down for putting some Irish stout in a chocolate cake. Whoever originally decided to try that idea out deserves all the rainbows and pots of gold. 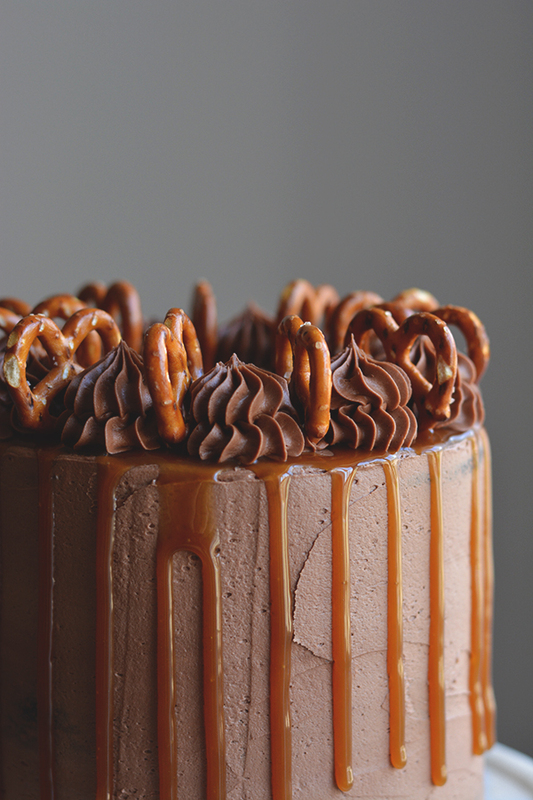 I’ve made plenty of chocolate stout cakes over the years, but I have to tell you, I think this one is my favorite. I basically took my favorite chocolate cake recipe, the famous Hershey’s Black Magic Cake, ditched the brewed coffee and buttermilk, and replaced it with beer. Can’t be that bad, right? 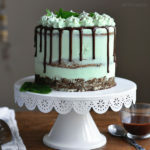 The fun St. Patrick’s day part of this cake is the *stout beer caramel* that goes between the layers and all over the top. Homemade caramel recipes usually include about a cup of sugar, 6 tablespoons of butter, and 1/2 cup heavy cream. One of my secret life missions is to replace the cream with as many different things as I can. I’ve done beer, whiskey, bourbon, Kahlua, coffee, and flavored coffee creamers. Other things on my list are apple cider, Fireball, Bailey’s, coconut milk, and, obviously, champagne. I’m not sure why I haven’t done that last one yet, honestly. We’re way past due on that one. 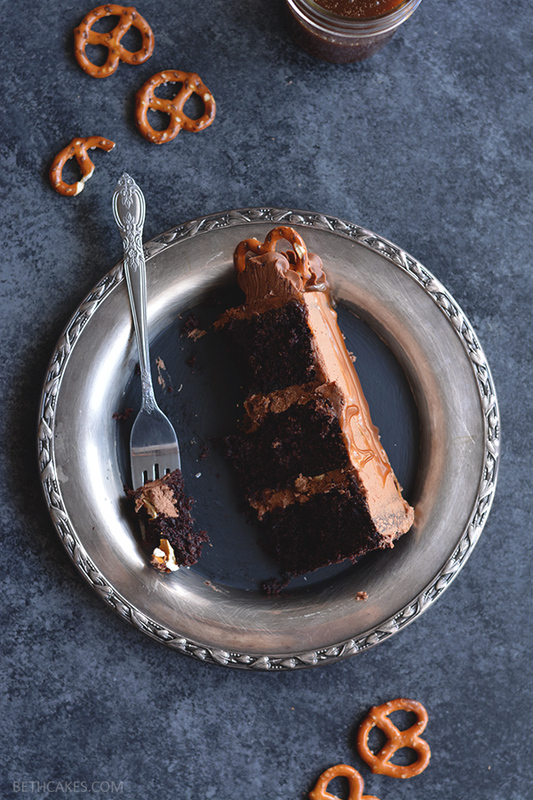 I originally bought pretzels for an entirely separate thing I’m hoping to make for the blog, but then realized they’d be PERFECT with this rich chocolate cake and this boozy caramel. It just needed something a little salty to cut the sweetness. So I ran some through a food processor and then sprinkled the crumbs between the layers. As usual, there’s a lot going on with this cake. So if you’d like to break it up a bit, I’d say you can definitely make the caramel sauce in advance. 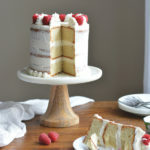 You could also do the cake layers the day before you plan to serve this, and then frost and decorate the day of! Preheat oven to 350°F and spray three 6-inch (or two 8-inch) cake pans with nonstick spray. Whisk together flour, cocoa powder, baking soda, baking powder, and salt. Set aside. Combine sugar, eggs, oil, and villa in a large bowl. Mix on medium speed with an electric mixer until just combined. Add half of flour mixture and half of the beer. Mix until just combined. Repeat with remaining flour mixture and beer. Mix until completely combined. Divide batter evenly among cake pans and bake for 25-28 minutes (23-25 min if using 8-inch pans), or until a toothpick inserted into the center of each cake layer comes out clean. Let cakes cool in pans for 5-10 minutes. Then transfer to a wire rack to cool completely. Heat sugar in a medium-sized saucepan over medium-high heat; stir constantly as sugar begins to form small clumps. Continue stirring as sugar melts and turns golden brown. 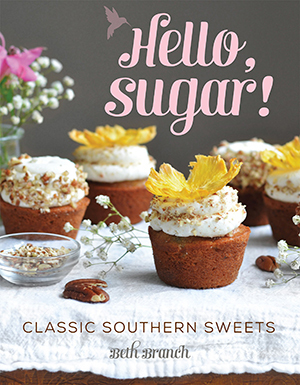 Once sugar has completely melted, add butter gradually, while continuously stirring. (I find it helpful to stir with one hand and add pieces of butter with the other.) The melted sugar will bubbly angrily at you when you add the butter (because it's cold and the sugar is hot), but just keep stirring! Once all the butter has been added, stir constantly with one hand and slowly pour in the beer with the other. Cook, stirring constantly for 1 minute. Add cocoa powder and vanilla; mix until completely incorporated. Add half of the powdered sugar; mix on low speed until just combined, and then medium-high speed until completely combined. Repeat with remaining powdered sugar. Place one cooled cake layer on a plate or cake stand. 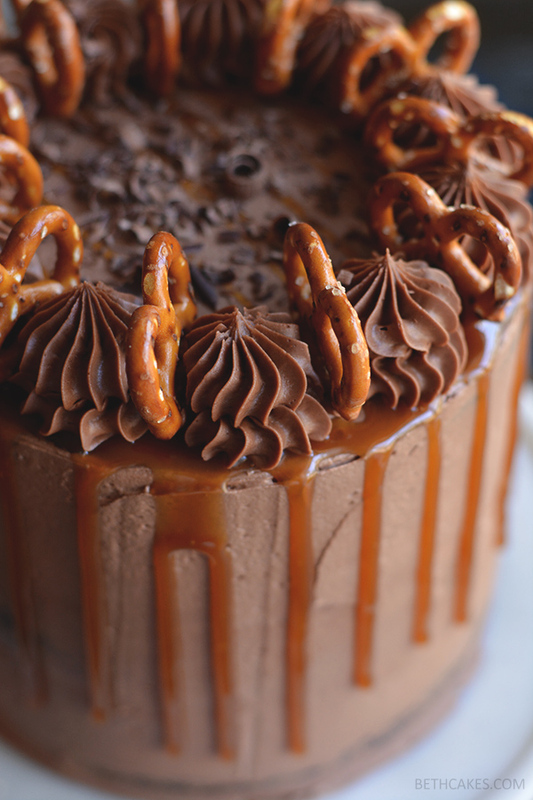 Cover with frosting, drizzle with caramel, and add a nice even layer of pretzel crumbs. Repeat with the second layer. 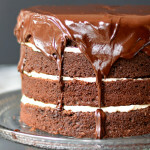 Top third layer with frosting and spread all over cake. 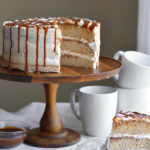 Drip caramel down the sides and drizzle all over the top. Pipe swirls with any remaining frosting and decorate with whole mini pretzels. Beautiful cake Beth and you photos have me wanting to touch the cake. You are so talented and this looks just devine! I love your site and get so excited when I see a new post. Keep up the awesome work! 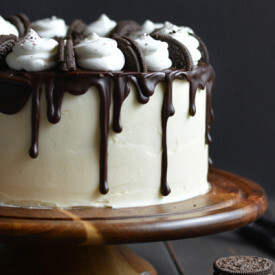 The world would be a better place if we all ate cake everyday! What a beautiful and stunning cake!! 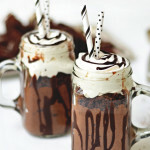 I love the addition of salty to the chocolate cake and of course adding some booze in there. Beer caramel sounds delicious!!! Happy St Patrick’s Day! PS: I am also in LOVE with your new site look. SO clean and highlights your gorgeous images. 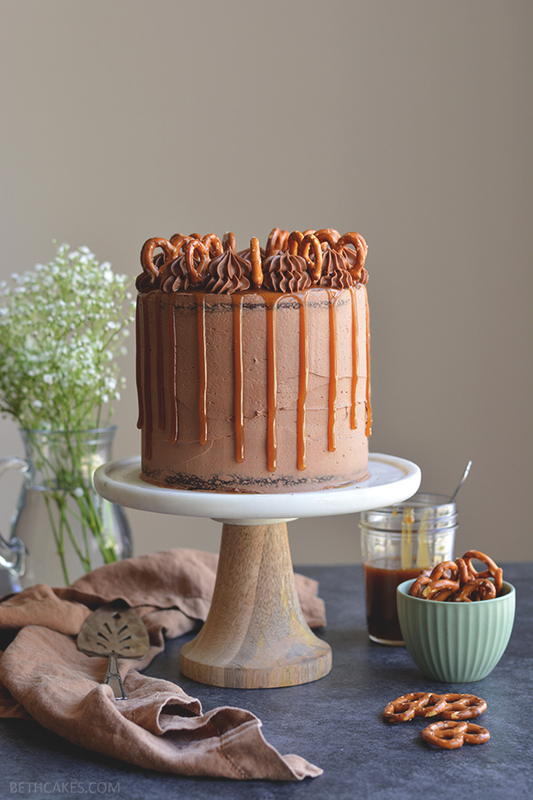 This cake is exactly why Southern Living chose you as a food blogger to watch in 2017! This looks amazing and I want to try it. How early can I decorate the cake before the celebration?